1 Rococo sounds like a super ball ricocheting around a room, but it's not. 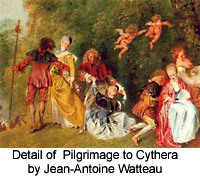 It was a fanciful art style of the 18th century that broke away from the stuffy style of painting that came before it. It is easy to smile when you look at a Rococo painting with the gentle ladies on nature hikes in their extravagantly ruffled dresses. 2 The word Rococo came from two words. It was a combination of the French word rocaille, which means shell, and the Italian word barocco, which means "playful decoration with irregular stones and shells." Rococo pictures are full of gentle curves and round forms that helped give the style its name. 3 The Baroque style, which came before the Rococo style, was a lot more serious. Baroque artists liked dark colors. Baroque artists painted heroes and suffering martyrs. During the reign of King Louis XIV, the French Baroque artists followed strict rules. After the death of the Sun King, people relaxed. Paintings became less formal, and Rococo art began. Rococo art reached its height around the 1730s. Feedback on What Is Rococo?